Evelyn Lure Sandersen died October 20, 2012 at the Sterling House in Longmont. She was 90 years old. She was born August 28, 1922 in Estes Park to Grover C. and Hattie Opal (Clark) Williams. On July 11, 1943 she married Edward H. Sandersen. They lived in Berthoud for a short time, and in 1947 moved to a farm west of Longmont in the community of Hygiene where they lived until 1992. At that time they moved into Longmont. After Ed and Evelyn moved into Longmont, she began a long association with Longmont Rotary Club in preparing the Club’s weekly lunches, first as an assistant to dear friend Gayle Zewek, and then as the lead cook. She was honored by Longmont Rotary with the presentation of a Paul Harris Fellowship for her years of Service Above Self. Evelyn was a loving wife, mother, grandmother and great grandmother. She worked alongside Ed on the farm every day. She was responsible for raising the baby calves and chickens. She was a long time active member of the United Methodist Church of Hygiene, working Hobo and St. Patrick’s Day dinners at the church for many years. She was also a member of the Hope and Hoe Garden Club. She enjoyed quilting, doing beautiful embroidery work, putting puzzles together and playing bingo with her friends at Sterling House. Evelyn loved being with her family, making cookies and pies for them. One of the family’s fond memories is having Sunday dinner together every week. She was preceded in death by her husband Ed on Oct. 1, 2006, two bothers Grover and Buford Williams and a sister Loyce Humphries. 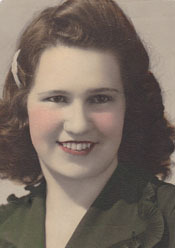 Evelyn is survived by one son; Marty Sandersen (Janet) of Longmont, four daughters; Sandra Sue Sandersen of Longmont, Nancy Platt (Bill) of Wheatland, Wyoming, Linda Sandersen of Longmont and Pat Sandersen of Longmont, four grandchildren; Todd Platt, Heidi Platt, Matthew Sandersen and Stephanie Sandersen, one great grandson; Dane and two brothers; Don Williams (Gwynn) and Glen Williams (Kathy) both of Longmont. Visitation will be 5-7 pm Tuesday, Oct. 23, at the Ahlberg Funeral Chapel, with family present. Funeral services will be 10:30 am Wed. Oct. 24 at the United Methodist Church of Hygiene. Interment at Foothills Gardens of Memory. In lieu of flowers, memorial contributions can be made to United Methodist Church of Hygiene or Hope and Hoe Garden Club, in care of Ahlberg Funeral Chapel. Visit www.ahlbergfuneralchapel.com to share condolences.